You've found the “U.S. 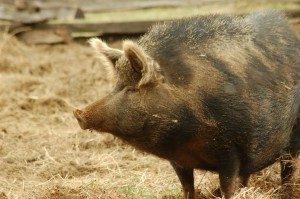 Ossabaw Island Pig Breeders” page here at Hobby Farm Wisdom! If this is the first time you have visited our site: Welcome! The Ossabaw Island pigs are a breed of pig developed from a group of feral pigs on Ossabaw Island, Georgia that were originally left there by Spanish explorers. The characteristics of Ossabaw Island pigs are influenced by their island habitat. Therefore, they are small is size, typically standing less than 20 inches tall and weighing less than 200 pounds at maturity. The most common colors of this breed are black and spotted, although a wide range of colors are possible. Ossabaw Island pigs have long snouts with upright ears and a heavy coat of bristles. Their meat has a unique texture and is considered well suited for pork, cured meats and pig roasts. Currently, they are considered critically endangered.